Growing up, I had a very small family. It was my mom, my brother and me with a few extended family members distributed throughout the west coast. Then I married into a large family – my husband has three siblings, two step-mothers and countless aunts, uncles and cousins. I was overwhelmed but embraced the idea of being a part of a big family. Not only did I marry my husband and acquire his family as part of my life, but I acquired his friends, too. Between the two of us, keeping up with our friends and family can get a little distressing. Our Christmas card list is insane! But I do my best, and I’ve found that I actually enjoy the connections I’ve made with my extended family. One of the best things for me about living in Las Vegas is that everyone wants to come and visit! Since we moved here six years ago, we’ve never had a problem getting friends and family out for a few days. Even if someone isn’t into the gambling scene, there’s still plenty to see and do. I’ve gotten pretty good at playing “Las Vegas Hostess With the Mostess” and at catering each person’s visit to what I think they’d enjoy doing. 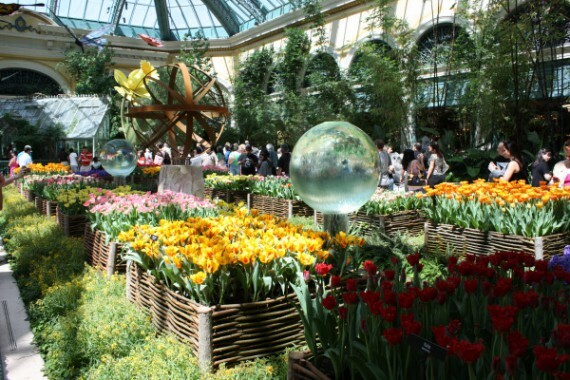 The Bellagio Botanical Gardens in the springtime. I love to take my all of my guests to the Bellagio Botanical Gardens on Sunday mornings. I call it “church” and, to me, it kind of is. It’s an enormous room just off of the hotel lobby that hold extraordinary flower arrangements, fountains and sometimes sculptures. I can smell the fresh sweetness even before I step into the gardens. The theme is changed with every season, and sometimes it will reflect a holiday, too – the Fourth of July display is one of my favorites! It’s open to the public 365 days a year and it doesn’t cost a penny to visit. It’s something that I think everyone passing through Las Vegas should experience, and plus, it’s a great place for taking pictures! We take our family Christmas card pictures there every year. I have quite a few shopping lovers in my circle. Some of the best (affordable) shopping is at the Miracle Mile Shops in Planet Hollywood. Watch for the laser light show or the thunder and lighting rainstorm while you’re window shopping! The Forum Shops at Caesar’s Palace are another favorite, where we can browse the stores, enjoy the fountains and the soothing, blue ceilings with painted-on clouds. Although most of the stores here are above my typical shopping budget, it’s still worth going. Taking my kids along can be very hectic and stressful – imagine two, bored kids in the mall who would rather run up and down the walkways screaming instead of quietly strolling through stores. Um, yikes! But The Forum Shops are probably the easiest shopping in town for me because the kids are as entertained as the adults are from all the visual stimulation. We usually stop at The Cheesecake Factory inside the shops for a yummy lunch before heading home. My kids love the enormous fish tank right outside the restaurant, too! 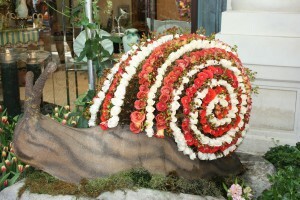 A snail's shell made of roses at the Bellagio Botanical Gardens. My parents come for a visit at least once a year. My step-father is an avid bird watcher, and he and I take day trips up to Red Rock Canyon with our binoculars and sunscreen. About a 30 minute drive from my house, pictures really don’t do this area justice – the views of the desert and mountains are truly breathtaking. Even though I’m not as interested in the specific birds like my step-father is (Me: Oh look, a red bird! And there’s a blue one! ), I appreciate taking in the fresh air and beautiful, vast landscape. Bird watchers – stay tuned for a future post on our favorite places to find birds in Las Vegas (I’m getting my step-father’s help on this one!). I’m still perfecting my skills as the Las Vegas hostess, but I feel like I’m getting the hang of it. There are lots of advantages to living in Las Vegas. One of them is always having friends and family in town. Another is that there is something to please every kind of visitor – I’ll never run out of things to do with my guests! I have relatives in town this week — A niece and her husband and their first baby. Comparing notes a bit, what places would you recommend for such a visit? Perfect weather we’re having for visitors! How old is the baby? Fashion Show Mall is fun but not stroller friendly at ALL. Those crazy elevators are so confusing and take forever. But if the baby is carried via sling then you can take the escalators instead! Lake Las Vegas – so pretty there and lots to look at!